We deliver over 2000 projects per year using only our proprietary panel. Last year alone we achieved over 1000 cancer studies (including 70 hemophilia studies). Consultancy and advice to ensure your survey is appropriately tailored for the Japanese market. 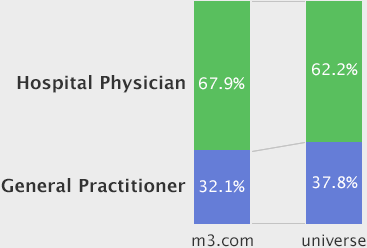 Over 300 physician respondent recruitments in the last year. A comprehensive service, including the provision of highly experienced moderators in all major Japanese cities. Appropriate methodologies which fits well with your study objectives. M3, Inc. maintains professional relationships with over 250,000 verified Japanese physicians, which accounts for about 80% of the total physician workforce in Japan. We also have connections to ～120,000 pharmacists, ～80,000 nurses and other healthcare professionals in Japan. We have healthcare experts ready for quantitative and qualitative research, providing our client’s access to the largest healthcare community in Japan. We tailor market-leading, comprehensive solutions to your methodology. With over 15 years’ experience building and managing our large panel, along with ISO 26362 certification and compliance, you can rest assured your projects are in the best hands. Since we work solely in healthcare, we have the fastest delivery times and guarantee quality to our clients. We are trusted by major global pharmaceutical companies, market research companies and consulting firms for whom reliable data, often with a rapid turnaround, is essential for success in the healthcare industry. We are a Japanese company listed on the 1st section of Tokyo Stock Exchange Market #2413, audited by Pricewaterhouse Coopers. Copyright© M3, Inc. All Rights Reserved.